From M. S. in Royston, Herts. James - Building inspector finally passed all my building work this day. In relation to the stair rope. He stated that it met all the requirements as to suitability for strength of product and fixings. He said it could not be faulted, and was just as strong as wood or metal hand rails. So should you ever have any other enquiries as to the rope passing the building inspector test, then you can say at least one council likes it. Thank you again for this stair rope and it looks great in situ. Hi James - Just to let you know we did actually receive the rope on Saturday and actually managed to put it up that day! To say that we are delighted with it would be an understatement - it has finished the look of our hall beautifully. Thanks for a great product. Rope arrived today, is installed and looks fantastic. Many thanks for your help and may I commend your excellent web site. James - The deliveryman knocked at 8.45 today. I have my rope, it's coiled in the box like a very well-dressed snake, waiting to get to work. The brackets are simply designed with a smooth silk like finish revealing the clean light colour of the metal, slightly lighter in tone to satin nickel. The manrope knots are immaculate and tough. 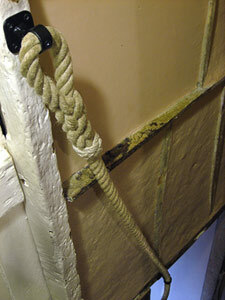 The rope will make a big impact to the entrance of my terraced, cottage style double-fronted home. Clean, warm, functional, well designed and beautifully made. Thanks James. From G. W. in N.Yorkshire. Dear James - Great to see such great craftmanship in this day & age. hello James - The stair rope has been installed! It looks terrific! - Thank you so much. James, Arrived in the post yesterday morning - Exactly what I wanted - Many thanks for the prompt and friendly service! Sorry I didn't get back to you earlier. It came on Monday, and it was installed today - looks great! Thank you very much for your help, we love it. Hi James, Just to say all arrived well and is installed and looks great. Thank you very much indeed. The stair ropes are BEAUTIFUL and PERFECT. I love them. Dear James - The stair rope arrived on Monday and we put it up on Wednesday. It looks fantastic - thanks very much. From C. S., Fareham, Hants. Parcel received, rope looks great & have already given your web address to two people who think the same! From M. K., Charing, Kent. From J. H., Otley, Suffolk. From S. A., Rockford, IL, USA. Hello! I received my stair rope two days ago. Meant to email right away to tell you I absolutely love it and can't wait to have it installed. Thank you for your prompt delivery! From J. T., Pewsey, Wiltshire. 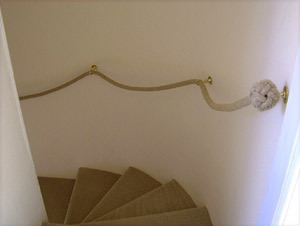 Dear James, the stair rope is now installed... and looks beautiful and works brilliantly. Many thanks indeed for all your help with this. From C. D. in Market Harborough, Leicestershire. 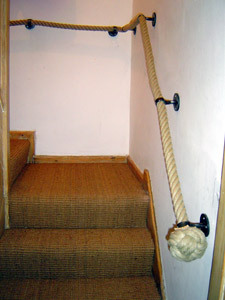 Hi James - The stair rope arrived and we've installed it. It looks excellent and your care in taking our order was time well spent as it was easy to install and looks perfect. Thank you for your time and patience, we can't wait to show it off! 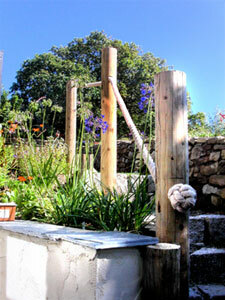 Custom made wrought iron railings with 32mm synthetic hemp rope and eyespliced ends. "Wow, that looks really cool"
many thanks for an excellent product and service. The rope has arrived and it looks great installed. It was good doing business with you. We are delighted, thank you so much for all your measuring and installation advice. They couldn't be any better! It looks better than I had expected and it's going to fit in perfectly with the new decoration. Many thanks for a superb product. From A. and L. P. in Huntingdon, Cambs. I'm just writing very belatedly to say thank you very much indeed for your prompt and efficient handling of our urgent stair rope order last month. From J. and R. D. in Bristol. Hey, it's FAB. Looks great, and functions really well. We're delighted with your work. Dear James - Just a quick note to let you know that we have received the parcel and are very pleased with the stair rope. Thank you so much for your quick response to our order. Dear James - Just a quick note to thank you for the stair rope which arrived yesterday. It really looks far better in the flesh that on line and I'm sure will look truly sensational when installed. Thanks again for such a prompt service. 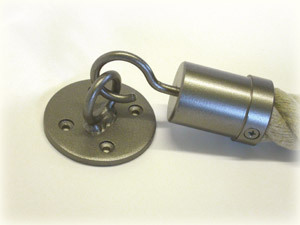 Custom made wrought iron barrier rope fitting. James, Many thanks for the prompt and efficient service. 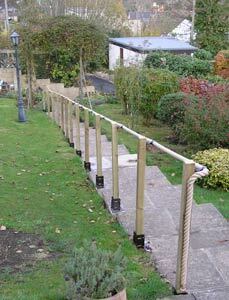 Hi James - Just wanted to say a huge THANK YOU for our lovely stair ropes that arrived safely today. D. has installed them this evening and they look FANTASTIC. Thanks for all your help, advice and professional service throughout. I would/will highly recommend you and your business. Thanks again. Hi James - Recieved the rope complete with brackets ,thanks its not up yet but hopefully in the next day or two... Thank-you for your good customer care. Thank you so much, James - we were over in the UK earlier than planned but parcel arrived 2 days before we left. It's now 'in situ' and we are very pleased with it. Thank you again. 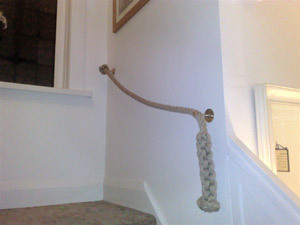 Hello James - We received your Stair Rope as you had said we would and today it was fitted. I just wanted to let you know how delighted we are with it. It is everything we expected and sits very well in out cottage (a 16th Century job). As an ex-sailor (yachtsman that is) I can appreciate the skill and workmanship that has gone into the finished product and it looks brilliant. Thank you very much. Thanks for the ropes - up and looking great! From C. H. in Hurst, Berkshire. Thank you James. You have done a wonderful job. I just hope our installation skills do the handrails justice! Many thanks for all your help and patience - I will be recommending you to everyone who admires them. From S. C. in Partington, Manchester. Thanks for all your help, so professional and efficient. From P. C. in Birmingham. I recieved my parcel yesterday and wanted to thank you. I am delighted with my new purchase and will certainly recommend you to my friends and family! From R. R. in Brighton. recieved. many thanks. Looks great - exactly what I wanted. Might need another one, so will be in touch. From A. P. in Norwich. Just a line to say thankyou, the ropes are up,we both feel safer on the stairs and are very happy with the quality of your product and ease of installation. From P. S. in Saltash, Cornwall. Thanks James. I have now fitted it to the wall. It improves and complements the staircase. From D. P. in Bihops Stortford, Herts. Thank you very much for your speedy service - very efficient and by the way your web site is the best, clear, concise, precise and to the point. From L. P. in Ryarsh, Kent. Received on Thursday. Fit perfectly and look great. From C. W. in Daventry, Northants. I received the stair rope when I got back to work today. It looks fantastic! We shall definitely be in touch to order a second stair rope once the next phase of decorating is done. From A. M. in Ballymena, Co. Antrim. Just had stair rope installed.Really good job.Very pleased. From D. D. in Tring, Herts. Stair Rope received, and installed and looks terrific. Thank you James I have received it and it looks great! From J. P. in Langport, Somerset. 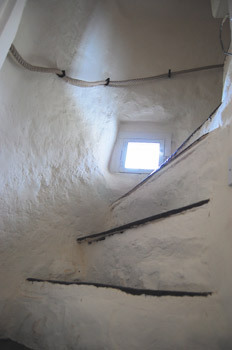 ...the stair ropes are fantastic, my boss was very envious. From M. R. in Stanwick, Northants. Dear James, Thank you for the great stair rope. From D. P. in Rochester, Kent. James, The rope is on the wall and looks absolutely fantastic! Very quick and efficient, I will recommend you to anyone that asks where it came from! ...a quick thank you for sending my order through so quickly. From L. C. in Manchester. From J. L. in Hastingwood, Essex. 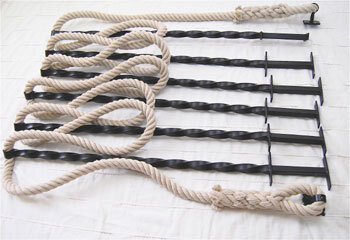 Hello James, I have received the stair ropes and bell pull, I am very pleased with them. They are lovely. Thank you. From C. D. in Redhill, Surrey. Hi James, Just to let you know, the rope arrived today and looks great! From S. H. in Trowbridge, Wiltshire. Received stair rope today thank you, it's great! From J. T. in Gorleston, Norfolk. From S. W. in Maidenhead, Berkshire. Hi James - received parcel last week. Rope looks fab - may well order another one! From A. W. in London. IT'S FANTASTIC!!! I'm thrilled to bits with it and I've told several people who've already asked over the phone where I got it from!! Thank you very much for a great service and I have to say very reasonable in comparison with other makers on-line. Well done and many thanks! From S. H. in Wigton, Cumbria. From T. N. in Runcorn, Cheshire. Rope received and up on the wall looking lovely. For more advice or information about our bannister ropes and hand rails, and to order a stair rope, you can contact James Watson directly at Stair Ropes.com. All content on this website is © (copyright) 1994-2019 - StairRopes.com and Stonk Knots, unless otherwise stated.